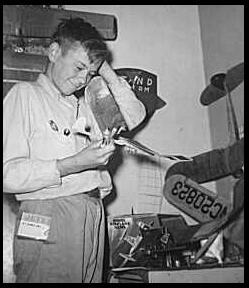 Photos and notes related to 1954 - 1956 diary. 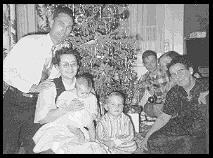 This is our family in 1952 (on the left) and in 1956. 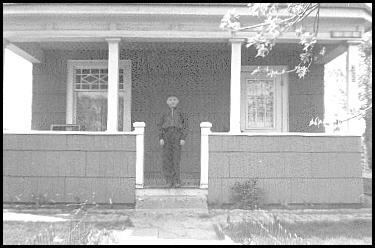 This is a 1954 photo of me standing on our front porch. This double exposure was taken with the camera braced on a ladder. 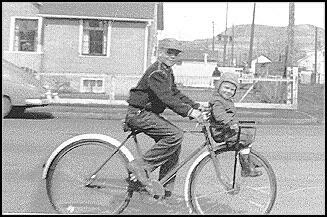 Photo of Bruce and myself, about 1956. I carried him in the carrier quite often. At that time there was no public concern over safety, so we were lucky that I was not accident prone. 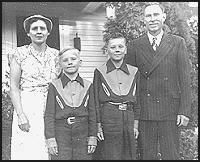 When it was not hatching season, Mom kept busy with creative things like crafts, sewing, etc. 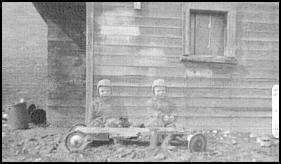 Her spirit and imagination are evident in this photo which was taken when she was about 65 years old. She dressed up on this Halloween and went to my cousin's place for trick or treat, and to see if they would recognize her. 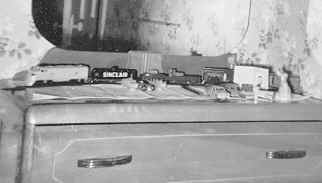 This photo of my dresser top was taken not long after the last diary entry. and this is what it looked like about five years later. was soon doing well in national contests. 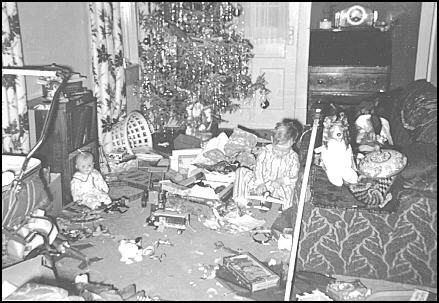 Bruce plays in the mess created on Christmas morning in 1956. This is the end of our long and narrow living room. The house was built about 1913.
to notes related to diary.